(Phys.org)—An international team of researchers has found that gene transcription in an organism that has died continues for several days. In their paper published in the journal Royal Society Open Biology, the team describes their work analyzing gene expression in animals after their death. Because death seems like such a conclusive event it is difficult for many to think about the possibility of life-like activities occurring in the bodies of those that have died. Most know that some cell activity continues, as evidenced by continued hair growth, but now it seems that many other cells continue living for longer than thought and some even exhibit behavior reminiscent of repair or regeneration. As the authors note, little research has been done regarding what happens with gene transcription when an animal dies—hence, they embarked on a study of the process in animals to find out. Their study consisted of identifying mRNA transcript activity in cells located in several body parts and then monitoring such activity for up to 96 hours. In so doing, they discovered that gene transcription diminished in some cells but continued in many others, and actually increased in some after death. They note that transcription increased at varied rates in different cells, but report they found some degree of commonality between animals, suggesting that it is not random. The researchers acknowledge that they did not find a reason for the continuation of gene transcription after death, but suggest it is likely due to the sudden stress placed upon the organism as a whole as they experienced the dying process. They note that cells involved in embryonic development, inflammation, immunity and cancers were most involved in increases of after-death gene transcription. They also suggest that their findings might shed light on why some donated organ recipients, particularly those receiving livers, tend to be more likely to develop cancer—gene transcription in liver cells that occurred after the original owner died could have resulted in tumor growth. They believe further study could lead to better understanding of what has occurred in donated organs before transplantation into needy patients and screen out those that might pose a cancer risk. In life, genetic and epigenetic networks precisely coordinate the expression of genes—but in death, it is not known if gene expression diminishes gradually or abruptly stops or if specific genes and pathways are involved. 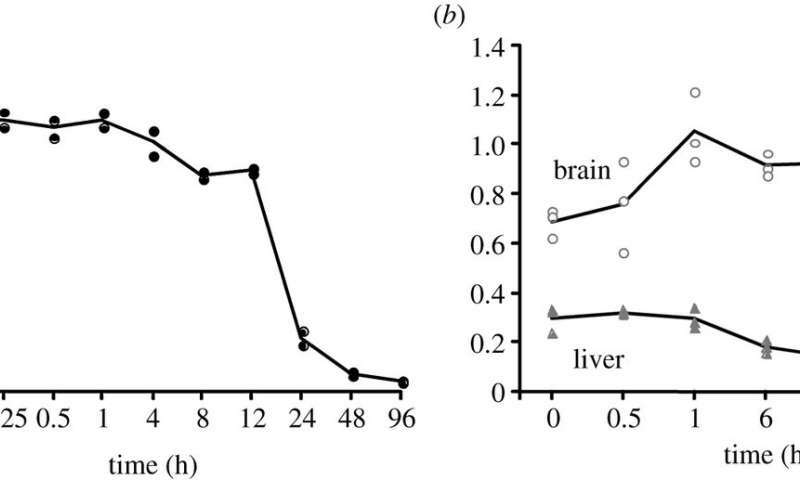 We studied this by identifying mRNA transcripts that apparently increase in relative abundance after death, assessing their functions, and comparing their abundance profiles through postmortem time in two species, mouse and zebrafish. We found mRNA transcript profiles of 1063 genes became significantly more abundant after death of healthy adult animals in a time series spanning up to 96 h postmortem. Ordination plots revealed non-random patterns in the profiles by time. While most of these transcript levels increased within 0.5 h postmortem, some increased only at 24 and 48 h postmortem. Functional characterization of the most abundant transcripts revealed the following categories: stress, immunity, inflammation, apoptosis, transport, development, epigenetic regulation and cancer. The data suggest a step-wise shutdown occurs in organismal death that is manifested by the apparent increase of certain transcripts with various abundance maxima and durations.